10) nonsense from PCs. HERE IS THE MICROSOFT LINK TO THE UPDATE. 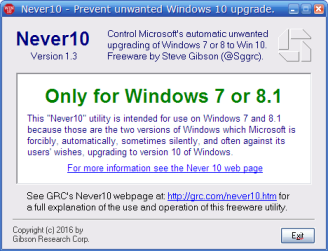 The name “Never 10” is a bit of an overstatement, since this utility may also be used to easily re-enable Windows operating system automatic upgrading. 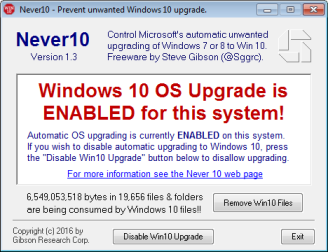 But the primary reason for using this is to disable Windows' pestering insistence upon upgrading Windows 7 or 8.1 to Windows 10. 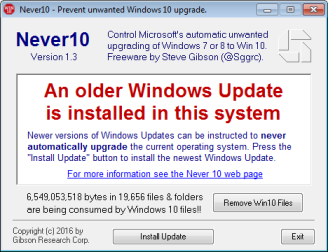 Many users of Windows 7 and 8.1 are happy with their current version of Windows, and have no wish to upgrade to Windows 10. There are many reasons for this, but among them is the fact that Windows 10 has become controversial due to Microsoft's evolution of their Windows operating system platform into a service which, among other things, aggressively monitors and reports on its users activities. This alone makes many users uncomfortable enough to cause them to choose to wait. In line with this, a few months into 2016, Windows 10 started displaying unsolicited advertisements on its users' desktops. Others dislike the changes Microsoft made by merging their failed “tiled” smartphone user-interface into the Windows UI. And, finally, some object to being force-fed whatever Microsoft wants and simply wish to choose for themselves. 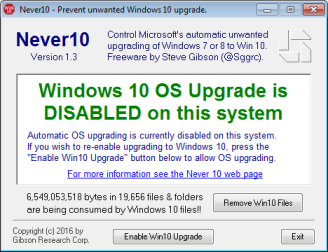 If the system being configured has a version of Windows Update which is older than the required July 2015 release—which would mean that the “upgrade disable” options are not yet present—this utility will notify its user (see the sample display screens above) and offer to download and install the required update to Windows Update so that Windows can then be configured not to upgrade itself to Windows 10. If Microsoft's GWX (Get Windows 10) had already secretly and silently downloaded the Windows 10 files into a hidden directory (this can be squatting on more than 6.5 gigabytes of your hard drive space), Never10 will show the exact count and amount of files and allow its user to remove them with one click. OS upgrading, it may be deleted after it has configured the system appropriately. Never10 v1.3 adds quiet command-line options for enterprise users. See the Command line options page for usage details.